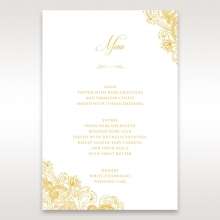 For an elegant wedding or anniversary celebration, consider this exquisite gate-fold invitation. The gates, made from deluxe gold pearl 240GSM paper, are intricately laser cut. These gates open to reveal the wedding details printed on marsala colored paper. 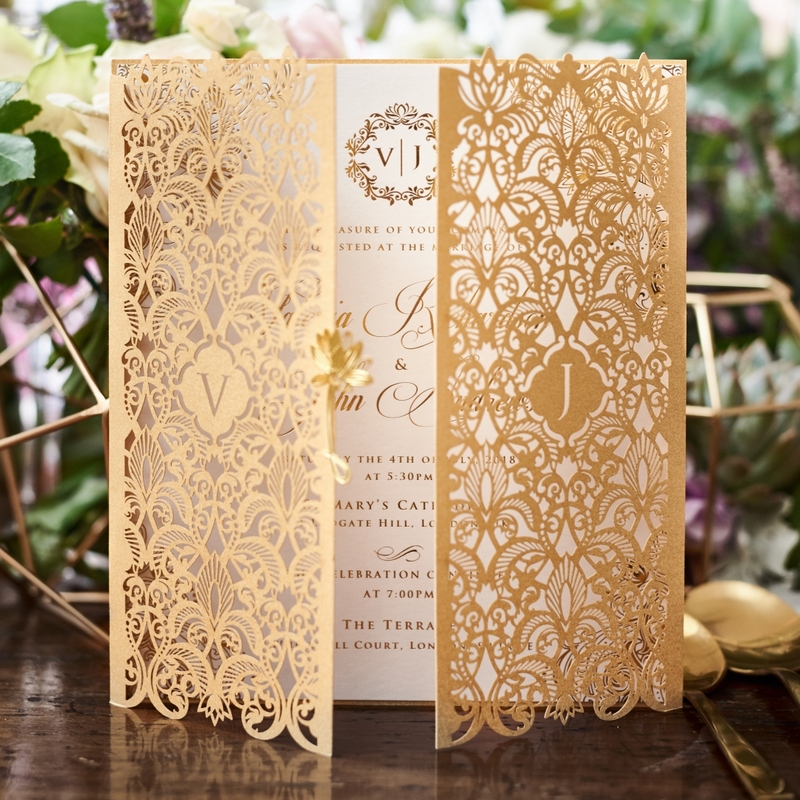 This invitation is printed with B Wedding's signature hot foil stamping technique, with corner embellishments that echo the intricacy of the gates themselves. 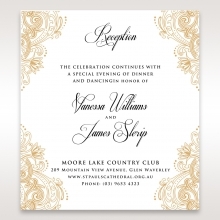 Colors shown here for this invitation are marsala, ivory, pearl, and navy. But, you can also order your wedding colors. 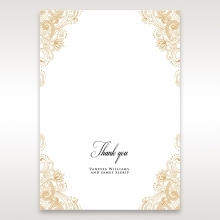 The stationery suite coordinates with the invitation insert to deliver an overall sense of elegance and grace. I ordered a couple of samples and fell in love with the imperial Glamour design! I chose to go with the Gold and Marsala theme for a quinceanero (sweet 15) I was celebrating along with the matching RSVP card! absolutely perfect! I loved the sample in almost every way. The only issue I had is the exterior laser cut design had a couple of marks that were peeling off. I took a couple of pictures to leave it in my review but there is not a place to post pictures. I want to really order these for my wedding but the price is really high and the section peeling off made me think twice about ordering. I absolutely LOVE this invitation! I ordered a few samples and this one was BY FAR my favorite! It's so elegant and exactly what I was looking for to invite my guests to Southern France. The foil is to die for, and even the envelope that the invite comes in makes it feel like you are receiving something special. I haven't found ANYTHING else that compares to this invitation. I am so excited and can't wait to hear what my guests think. By far the nicest invites I have seen so far and I have ordered quite a few from different suppliers! 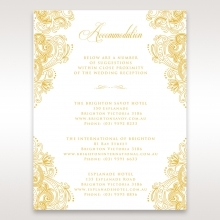 beautifully made, the gold colour is also the best gold I’ve seen on invites. They’re well made and calligraphy is beautiful. The quality of the paper is very good. The gold laser cut invites I ordered are slightly more expensive than your average invitation but you really get what you pay for, they look exquisite! I could not have been happier with finding this vendor. 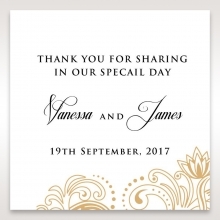 Their invitations are beautiful and the customer service was top notch. Although the prices are a little high, you definitely receive what you pay for. The details of the invitations is what makes B Weddings stand out. I originally had not planned to spend much on invites as I figured everyone would just throw them away. But, once I saw their sample, I was willing to go over my set invite budget to get them. The invite was absolutely gorgeous. Very elegant and looks expensive. The colors were vivid. The foil really made the invite stand out. The gem on the front of the invite is a really nice touch. One of a kind invite. Also, working with BWedding was easy. I emailed them to ask for an update on shipping and they responded immediatley. I ended up receiving the invite that day. I guess I was overly anxious and excited to get my hands on the invites. Based on the sample i received, this invitation is simply elegant and matches the theme of my wedding. Although the gold foil printing is minimum 50 pcs and I only needed 20. I will still order it because of quality. The laser cut cover with the gold leaf is very detailed and not flimsy at all. and the gold foil lettering is pleasing to the eyes. Which is why i fell in love with it more than the pearl paper without the gold foil printing. Received this order and LOVE this! So much detailing in this invitation made me impressed! I am a wedding planner and I showed my clients the invitation. They also fell in love with it that we are going to order more for their event! Can't wait to receive our other orders and share with guests! 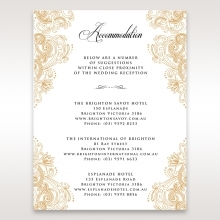 Remember, invitations are first impressions for any event. 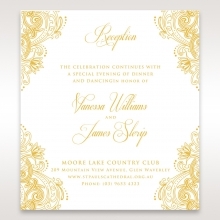 With this invitation design and style, you definitely set the bar up! These invitations are BEAUTIFUL!!!!! They are the perfect invitation for any event if you want to impress. I ordered them for a Church event, but will reorder again for a wedding soon. i ordered a sample of this and it is beyond divine. delivery was prompt. and the invitation itself is so unique and beautiful. glad i found this site. My review is based solely on the sample we received. We have not made any large purchases. The quality feels good. The card is sturdy. the envelope was sturdy. The laser cut flaps.were not floppy and did not bend easily. the cuts were clean. also the printing is clean and the color of the card we received was accurate to the picture. The color of the foil was also accurate to the picture. Again this is based just on one sample that we received. Absolutely Beautiful designs and stunning cards, received samples today and will definitely be ordering some for my wedding very soon. Very nice. I love the embellishment and the laser cut was flawlessly done. Great product I love it. 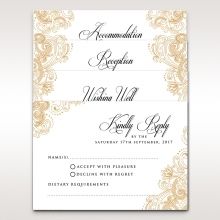 These invitations have high quality of the printing and the colors and it looks professional. 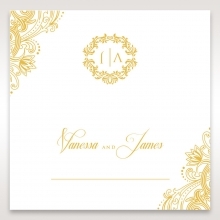 I ordered lots of invitation samples but I was very very pleased with this product and it will look amazing for my wedding theme that I will have it in christmas season and the to details in this design is amazing. 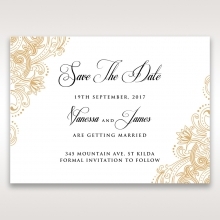 I highly recommend this company for everyone who's looking for great, unique and elegant wedding invitations. I love, love, love the sample I received of the imperial glamour wedding invite with a pearl finish! These invitations are so beautiful and elegant that it will set strongly set the tone for my very elegant event in a chateau for my guests! It is way more beautiful than some of the wedding invites I have received from other brides in the past. 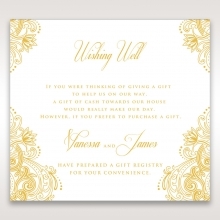 It is very crucial to my mother in law that we find a lavish invitation that does not break the bank! If that is what you are searching for, then look no further! The company offers a printing service with address printing for your guests, as well as a return address as well- which is wonderful for busy brides! The envelope is of a substantial size to accommodate for the large invite – in addition, it is very strong, good quality paper. 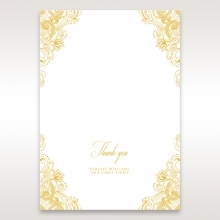 Upon opening, the envelope is lined with gold foil – absolutely stunning! It matches the rest of the invitation. The invitation I ordered the pearl and burgundy finish. Both breathtaking. However I like the pearl finish better. It is a lot more “airy” and easily welcomes love – makes you think of a wedding! The burgundy was a little dark, and somewhat hard to read. But very beautiful as well. The pearl finish paper is a little shimmery, and offers gold engraved printing with borders to match the laser cut gold gates! you are able to engrave the couples initials in the opening gates that are absolutely fantastic. the paper is of great quality, and the paper the envelope comes with a matching gold liner! in addition, to seal the gates is a raised lotus flower of some sort for a beautiful finishing touch! I did a quick order to see what I can add/subtract, and they offer matching RSVP, wishing well, and reception cards in a cute little envelope as well to add to the beauty of this invitation. They offer some suggestions to help get you started, but you can ultimately have your invitation state whatever you please. There is an available agent to help you on your way, and your invites are not created without you viewing and you approving the final invites – from what I can see, they are with you throughout the entire process. 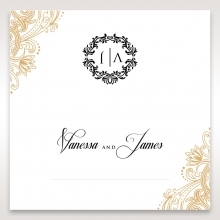 this is a strong contender in my wedding invite search – and I am very excited to work with the company to create an invite to last a lifetime! I love it! Nice layered wedding invitation with high quality at reasonable price. Upon receiving the sample, I was actually very surprised by the high quality of the printing and the pealized papers. I'm stunned by such vibrant colors. Nice quality papers. Nice double layered card and exciting colors! 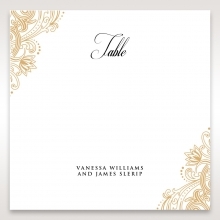 I’ve been looking for a simple yet elegant design that reflects our wedding theme and not too expensive and not too shabby. This invitation is all that and more. I love the color, which is blue, and the high quality of the invitations. I would definitely recommend this invitation to others. I ordered this invitation for my sister's bridal shower and they came out very nicely. I wanted to thank the customer service rep who was so patient and really tried to work with me. Fantastic service! It is beautiful!! 100% recommended!! I ordered everything here. Everything came out wonderful and very top notch. Their prices are great for such beautiful print. Very chic and modern invites that are in with the times, totally not your mother invites! They came quickly, in perfect condition with no mistakes. 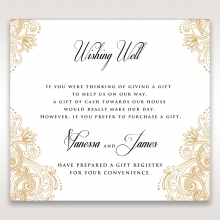 Much cheaper than buying invitations through stationary stores. Everybody just loved the invitations and they went perfectly with the wedding theme. I ordered these invitations after the first company I used failed to meet my expectations. About to lose hope, my faith was restored when I received the samples from this company. It wasn't till I got my actual invitations that my excitement started to build for my big day. I'm more than happy with how they turned out and I highly recommend this company to everyone who started looking to order their wedding invites. I had a lot of great vendors, and this was one of the best! I never imagined finding such high quality stationary for such a an affordable price! I was very pleased with the quality and professionalism. Invitations are exactly as pictured and the colors are beautiful! They also were delivered on time and undamaged. Thank you! I'm very, very pleased with my selections. The quality of paper (which is really important to me) was on point. The attention to detail in this design is unparalleled. 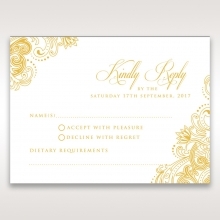 I highly recommend their services to anyone who is looking for unique and elegant invitations.